This book club provided an opportunity to discuss books with authors from 2009 - 2013. I like to think we were a group of daughters, sisters, wives, mothers, well... women finding time to meet while juggling daily life. I hope you enjoy exploring The Manic Mommies Book Club Archives. We read 46 books over the years, with audio or written author discussions for each book read documented on this blog. Today I'm thrilled to announce our June book selection, Elizabeth the First Wife. Lian Dolan is a returning author to the book club, we are beyond excited to discuss her second novel on June 12th. The book is available in paper and electronically - for those who love their ereader (myself included). Synopsis: Elizabeth Lancaster, an English professor at Pasadena City College, finds her perfectly dull but perfectly orchestrated life upended one summer by three men: her movie-star ex-husband, a charming political operative, and William Shakespeare. Until now, she’d been content living in the shadow of her high-profile and highly accomplished family. Lian will join us for 30-40 minutes before transitioning to chatting about books and life. 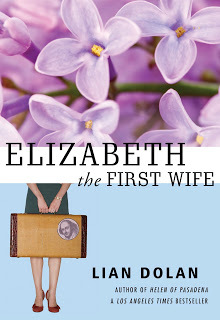 Giveaway: To enter this month’s giveaway, send me an email (comments are not considered entries) with ‘Elizabeth the First Wife’ in the subject line. Please include your shipping address in the body of your message. Winners will be selected at random on Sunday evening, May 12th. You hear me say it over and over... the women who participate in the Manic Mommies Book Club are amazing! 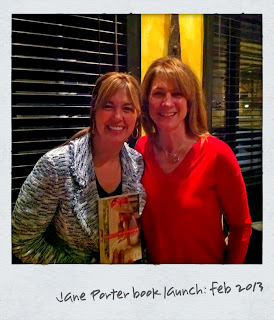 Last night we met to discuss our April selection The Good Daughter, with Jane Porter. Tears were shed, emails and texts passed through the evening. If you weren't able to join us, I will post a recap with a few questions for you next week after I've had time to review and write a proper recap of the evening. TODAY I'm thrilled to announce our May book selection, when she was gone. Gwendolen Gross is a returning author to the book club, we are beyond excited to discuss her fifth novel on May 15th. Synopsis: What happened to Linsey Hart? When the Cornell-bound teenager disappears into the steamy blue of a late-summer morning, her quiet neighborhood is left to pick apart the threads of their own lives and assumptions. Gwendolen will join us for 30-40 minutes before transitioning to chatting about books and life. Giveaway: To enter this month’s giveaway, send an email (comments are not considered entries) to mari.partyka [at] gmail.com. Put ‘When She Was Gone’ in the subject line. Please include your shipping address in the body of your message. Winners will be selected at random on Sunday evening, April 7th. How to find us: We are talking about books throughout the month on twitter. I have changed our hashtag to #MMBC2013 after learning another group is using our old one (making it hard to find our book chatter). We haven’t blogged about book club lately, but we still meet monthly. Last month we read a book with mixed reviews (from the group) but talked about the book for an hour. Fellow book clubbers know how divine it is to share something personal only to realize someone else has had a similar experience. The bonds you make with women are strong, and deep. I spent the evening with Jane Porter last week, this just happened to be her theme for the night. The strength of community that women create, how important is it to nurture these relationships. Have you thought about how different a holiday would be without mom’s crafting, decorating, and everything that goes into coordinating one holiday? Women cook, bake, clean, etc… to hold up families going through happy times, illness, death, and other life events. Jane Porter wasn't able to be with us on the Escape last November but if you attended you received a copy of book one in the trilogy, The Good Woman. I’m pleased to announce we are reading the second book, The Good Daughter, and Jane will be calling in to discuss the book with us on April 3. Synopsis: Kit Brennan has always been the most grounded of her sisters. A Catholic school English teacher for seventeen years and a constant giver, her decisions have been sound—just not very satisfying. Her fortieth birthday is right around the corner, causing Kit to consider some wilder notions, like skipping right past the love and marriage to raising a child all by herself . . .
A girls’ weekend away is just the reprieve Kit needs from school, Mr. Wrongs, and life-changing decisions. It’s there that she meets a man who’s dangerous; a man who challenges who she thought she was, or rather should be. Kit wants to indulge herself this once, but with one of her students in crisis and the weight of her family’s burdens weighing heavy on her heart, Kit isn't sure if now is the time to let her own desires take flight . . .
Jane will join us for 30-40 minutes before transitioning to chatting about books and life. The calls tend to last 60-90 minutes. Last month we had women knitting, feeding children, rocking babies to sleep, cleaning, and taking a bath. Calling in from NYC to California, Mexico to Switzerland! Giveaway: To enter this month’s giveaway, send an email (comments are not considered entries) to mari.partyka [at] gmail.com. Put ‘The Good Daughter’ in the subject line. Please include your shipping address in the body of your message. Winners will be selected at random on Sunday evening, Feb 17th. How to find us: We are talking about books throughout the month on twitter. In January we picked a YA book to read/discuss over Twitter. Book club, it’s happening! Hashtag #MMBC, or email me for additional details. June 2012 Book Selection Announced! I'm please to announce our June selection, The Singles. I have read a lot of light/fun novels recently and this is one of my favorites. 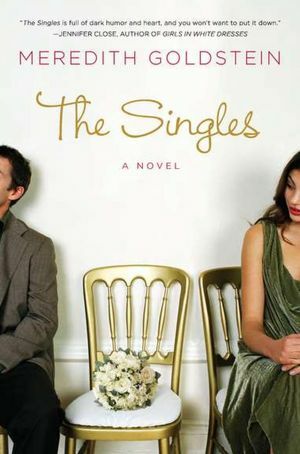 The Singles is told from different voices, the bride opens the story but it's told by the people to attend the wedding as a 'single'. As the story goes on we learn how the singles know the bride and groom, their relationships, insecurities, and more. It's a very fun look at an evening (and the morning after). I'm so excited to that we are reading this book and that we get to discuss it with the author, Meredith Goldstein. Giveaway: To enter this month’s giveaway, send an email (comments are not considered entries) to mari.partyka [at] gmail.com. Put ‘The Singles’ in the subject line. Please include your shipping address in the body of your message. Winners will be selected at random on Sunday evening, May 20th. May 2012 Book Selection Announced! Our May selection is one of my favorite books read this year. THE UNDERSIDE OF JOY explores the definition of family and the limits of love, postnatal depression, infertility, child custody and the role of step mothers. There’s something in this novel for almost everyone! I'm so excited to that we are reading this book and that we get to discuss it with the author, Sere Prince Halverson. Synopsis: Losing a husband is virtually unbearable. Losing your children to the birth mother who abandoned them, whilst you are still grieving, is one heartbreak too far. It must not be allowed to happen … Ella counts as her blessings her wonderful husband, two animated kids and an extended family who regard her as one of their own. Yet when her soul mate Joe tragically drowns, her life is turned upside down without warning, and she finds that the luck, which she had thought would last forever, has run out. When Joe’s beautiful ex-wife, who deserted their children three years earlier, arrives at the funeral, Ella fears the worst. And she may well be right to. Ella discovers she must struggle with her own grief, while battling to remain with the children and the life which she loves. Questioning her own role as a mother, and trying to do what is right, all she is sure of is that she needs her family to make it through each day. Yet when pushed to the limits of love, Ella must decide whether she is, after all, the best mother for her children. Giveaway: To enter this month’s giveaway, send an email (comments are not considered entries) to mari.partyka [at] gmail.com. Put ‘The Underside of Joy’ in the subject line. Please include your shipping address in the body of your message. Winners will be selected at random on Tuesday evening, April 10th. Mar: Why is my Mother getting a Tattoo?